In the winter of 1899 two strange creatures find themselves on the streets of New York City. Chava is a golem fashioned out of clay, alone and without direction following the death of her master. Ahmad is a jinni who finds himself free from his lamp after more than one thousand years of confinement. These two beings attempt to assimilate into the teeming streets of New York, and end up forging an unlikely friendship. This novel was very different from what I expected. Judging from the title alone, I had thought it would be a story about a creature from Jewish mythology falling in love with one from Muslim legend. And in a way it is, except that the humans who take in the jinn and help him to find his way are Maronite Christians who have fled to America to seek out better fortunes. 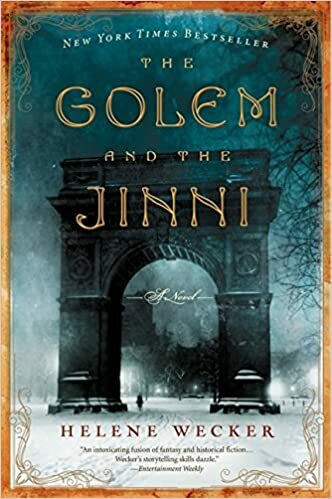 Also, rather than a love story The Golem and the Jinni is a surprisingly sweet story of two unique individuals who find in each other a kindred spirit. The friendship that emerges between the Golem and the Jinni is one of opposites. She is a creature formed of clay that was brought to life by a heretical rabbi. He is an ancient spirit of fire that spent his former days riding the winds of the Syrian desert. She is only weeks old at the time of their first encounter, uncertainly navigating the busy streets of New York and living in terror of discovery. He is a thousands of years old, possessing the confidence and arrogance that accompanies a creature of great power. Yet they find themselves united by their otherness and their loneliness. The story is centered around Chava and Ahmad, but they are surrounded by a wonderfully diverse cast of human characters. Author Helen Wecker captures the immigrant experience through the eyes of the bakers, smiths, and salesmen who populated the various ethnic neighborhoods of New York at the time. The people who came to the United States during this time period were either running from something or running to something, and the spirit and determination of their combined experience shines through this novel. The Golem and the Jinni is a big overlong and could have used a little trimming around the edges, but ultimately I enjoyed it. I definitely felt transported back to Wecker’s chaotic and diverse depiction of 19th century New York. It’s really interesting to think of Central Park being used as a grazing pasture for sheep.